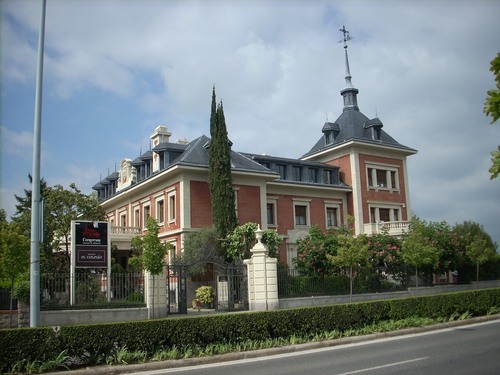 The Colegio Oficial de Medicos de Navarra, as a medical society, was founded in 1899 and has its current seat in this beautiful cottage in the outskirts of Pamplona (Avda. Baja Navarra, 47)1. In the entrance corridor some memories of the two Medicine Nobel Prize winner Santiago Ramon y Cajal and Severo Ochoa can be seen. - M.D.Martinez Arce, Historia del Ilustre Colegio Oficial de Medicos de Navarra (1899-2000). La Medicina en el antiguo reino de la antiguedad a nuestros dias, Gobierno de Navarra. Departamento de Salud, Pamplona 2002, pp. 459. 1. More informations can be found in the Colegio's official website (in Spanish).